Dun Ara Castle is a medieval structure sited 8 km north west of Tobermory. 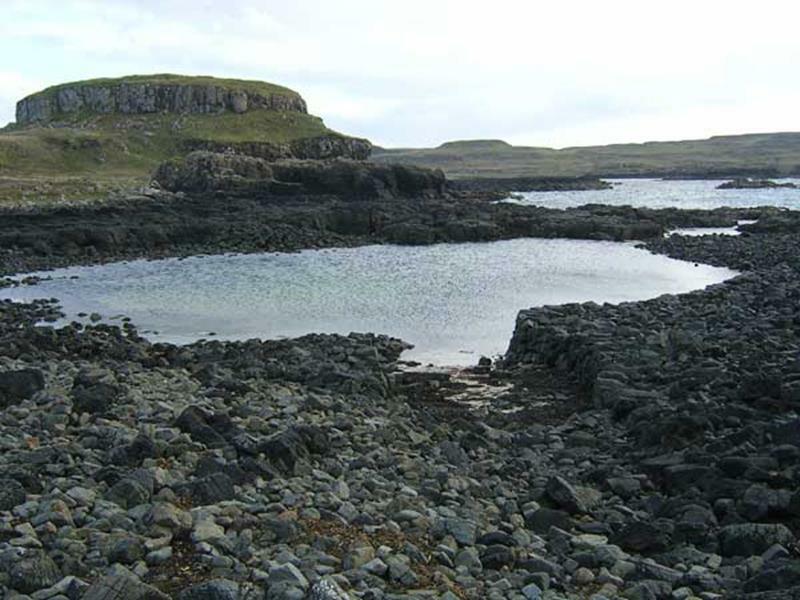 It occupies the summit of one of several prominent rocky outcrops that lie scattered along the shores of Mishnish in the neighbourhood of Sorne Point. Although there is now an estate track to the site, the castle was probably originally accessed by sea. The grassy estate track provides an undemanding walk from Glengorm Castle Café and Gallery through pastures with wide sea views, but the short assent to Dun Ara is rocky and steep – appropriate foot ware is recommended. The castle was fortified by enclosing the entire rock summit with a curtain-wall of stone and lime, which varies from about 1.3 m to 1.8 m in thickness. It is best preserved on the north-east side, where it rises to a maximum height of 1.8 m, but little remains on the south-west and south-east sides. The masonry was built with coarse, lime mortar, much of it has washed out of the facework giving it the appearance of dry-stone walling. It is possible that in places the lower courses of masonry pre-date the medieval castle and belong to an earlier fort that occupied the same site. The entrance is on the south-east side. In the interior are the footings of a number buildings, of which the largest was probably a hall measuring 12.3 m from east to west by 5.7 m transversely. The west end has been divided off from the remainder of the building by a stone partition wall, but his may be a secondary construction. The other buildings were of dry-stone construction. Fragments of a dry-stone wall lie below the east face of the rock and enclose an area centred on the castle entrance. This was probably a defensive outwork. Scattered around the base of the rock are the remains of eight sub-rectangular buildings, with associated cultivation strips and field clearance heaps. This was a small township, which probably grew up during the period that the castle was occupied. The buildings, none of which stands to more than 0.1 m in height, vary considerably in size, and one may have been a combined barn and corn-drying kiln. Most are reduced to turf-grown footings. An artificially-constructed harbour incorporating a small jetty, a quay and boat-landing, lies on the south-west side of the castle. At the upper end of the harbour are two boat-noosts (see photograph). It is hard to say when this harbour took on its present form, and some of the existing masonry may be comparatively recent, but the main features probably go back to the period of occupation of the castle.